You can use the share tab to enter dividend transactions for listed and unlisted companies. This section discusses how to add, edit and delete dividend transactions. 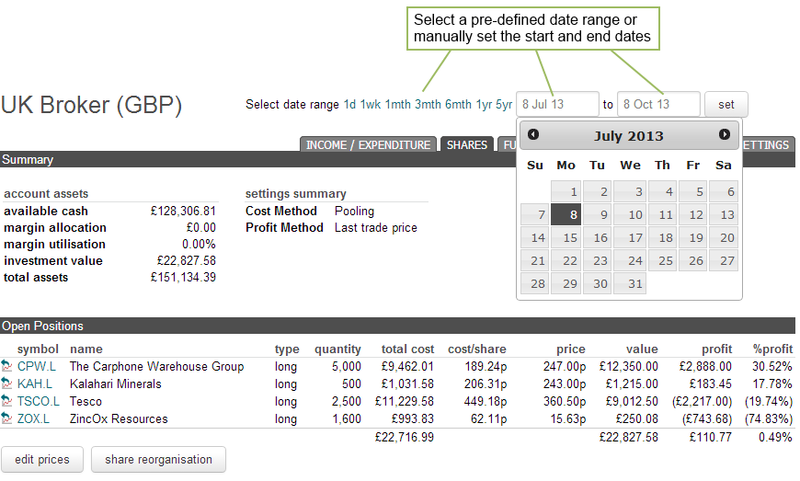 In this example we are going to add a UK domestic dividend to the 'Share' tab of a Portfolio Account. Within the share tab for a given Account, the dividend section lists the dividends that have been received between the selected 'start date' and 'end date'. To add a Dividend transaction, click on the dividend transaction ‘add/edit’ button (found at the end of the dividend section) as illustrated in the following screen shot. In this example we are going to add a dividend for Tesco (EPIC: TSCO.L). A domestic dividend was paid on the 22nd of December 2007, with a net dividend of 2.81 pence per share held. The total net dividend for 550 Tesco shares was £15.46 and there was a tax credit of £1.72 against the total net dividend. Please note that the total value of the dividend can be left blank if the share quantity and net dividend per share values are entered. For UK dividends, the 'net dividend per share' should be enter in pence (GBX) and the 'tax credit' and 'total net dividend figures' should be enter in pounds (GBP). For US and Euro entries all fields should be entered in US Dollars and Euros respectively. When you are finished editing your dividend entry click on the 'add' button. To delete a dividend transaction, tick the check box associated with the transaction, or tick the 'delete all' check box position beside the 'delete selected' button. When the transactions have been selected, click on the 'delete selected' button.